I found a Tatooine twin in our galaxy. It is a desert planet 1.5x Earth's size, orbiting a binary red dwarf star, like the famous Tatooine from Star Wars. But unlike the original Tatooine, this planet is tidal-locked: it's always turned on one side to its binary sun, and its cold opposide side is covered by snow. Surface conditions on this planet is like hell: it has a huge surface gravity of 3.3G due to big planetary mass (7.8 times greater than Earth) and a very high temperature of 1000 K (730 °C). 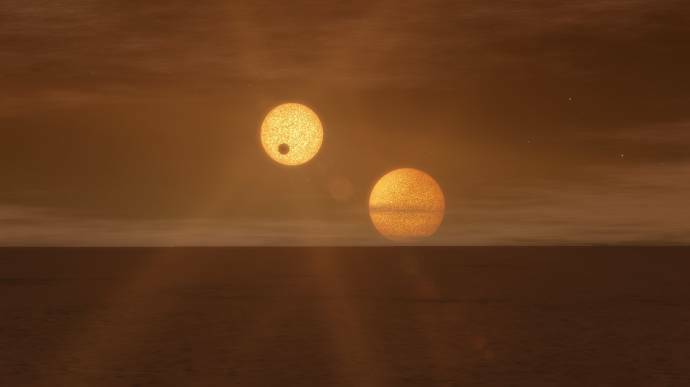 It has 2 moons (the original Tatooine has 3 moons) and a third sun , an orange dwarf at 4 AU away. 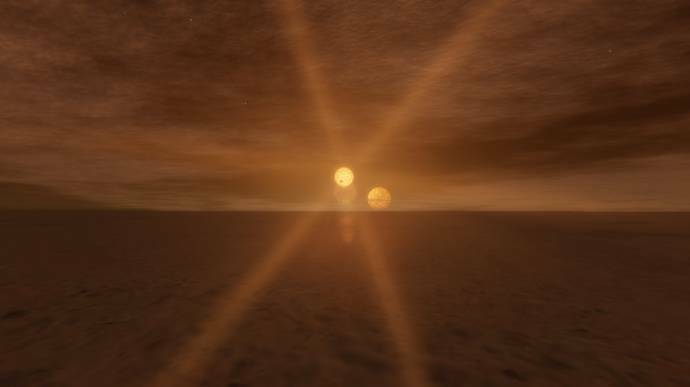 This image shows a binary sunset, despite the fact that the planet is tidal-locked, it has an elliptical orbit that cause librations, so the suns can rise and set in a narrow circular region that separates day and night sides of the planet. A closer look on a sunset: The dark spot on the brighter sun is a hot gas giant planet, it has an orbit much closer to the two suns when compared to the forefront planet. 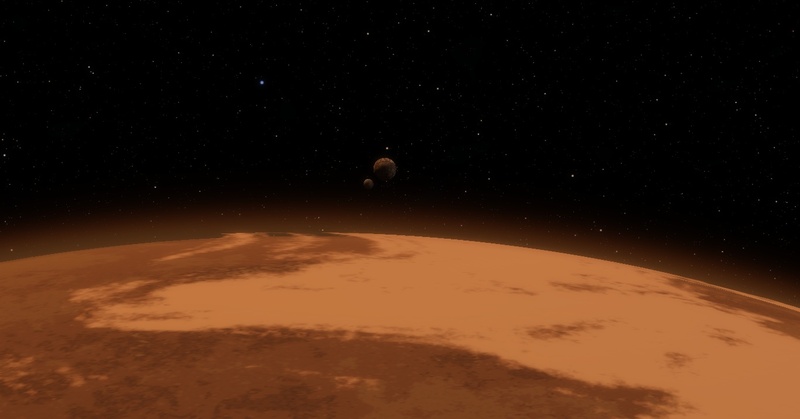 A view from low orbit with two moons visible. The bigger moon is farthest away and has an anomalous orbit, perpendicular to orbit of the smaller moon and planet. 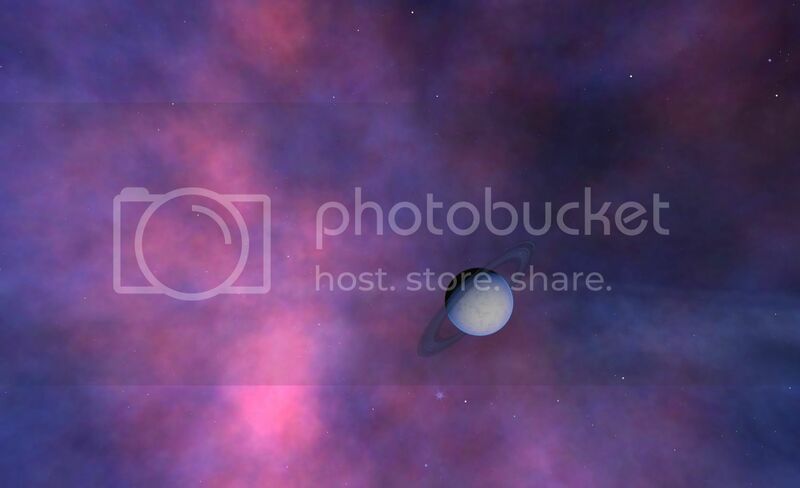 The planet name is RS 8404-480-8-156114-28 B3, it is also saved in locations menu (F6) in v0.95 release. So far, this crater on a life-supporting terra is my favorite location in 0.95. Just found this interesting planet in my own galaxy, very red with large rings, a perfect astronomy sight due to having an atmospheric pressure of 0.07. It's also in a globular cluster. Place	"Red planet in talisman galaxy"
One of my favorites is the system in HD 226868. In real life this system is the home of the first black hole ever discovered, Cygnus x-1. in space engine is a blue supergiant/white main sequence bynary system. there´s a venus clone in there (HD 226868 2) and an earth-like world (HD 226868 3), very young and lifeless. Cool features there, including huge cliffs. Its moon is even more interesting, with high mountains and canyon-filled landscapes which are amazing. I'm sick of bug hunting right now, so here is my current favorite place. Its in IC 1011, that hyper-distant galaxy I posted about a few month back. It's nice and far away from the Milky Way, and its a huge place. 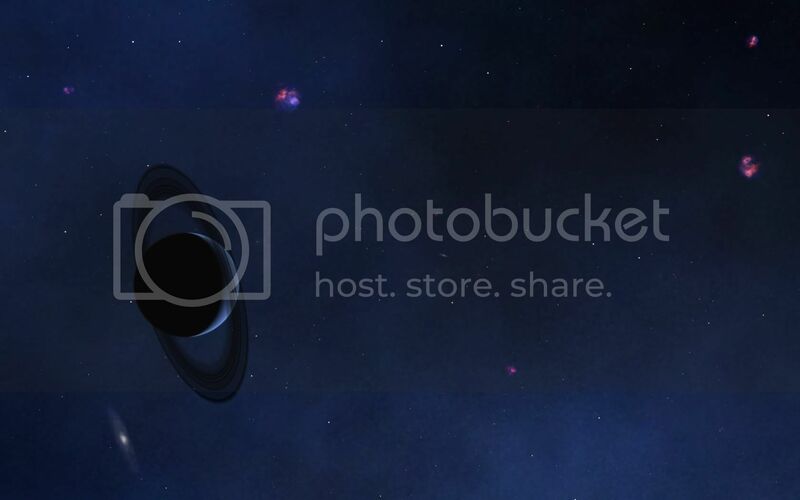 I went to the galactic core to take a look at black holes in the new version. Well, if you take a look at the bugfinding thread, that didn't end too well. 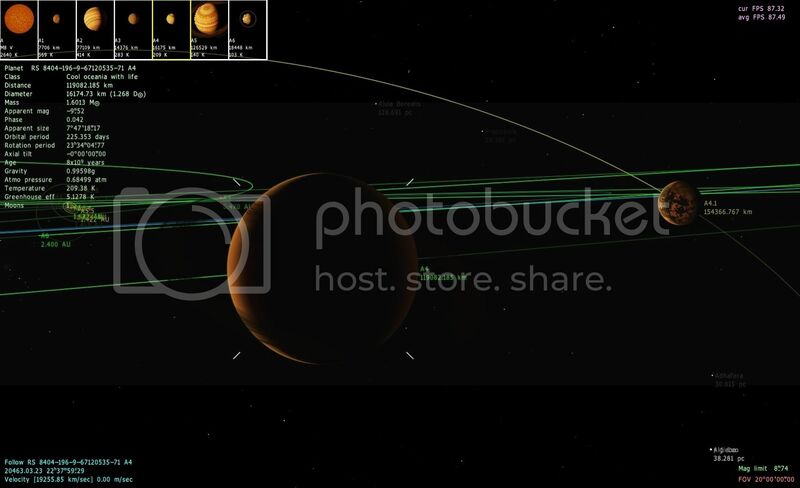 But I did take time to do some other things, namely look for habitable worlds close to galactic cores. I find such words fascinating. 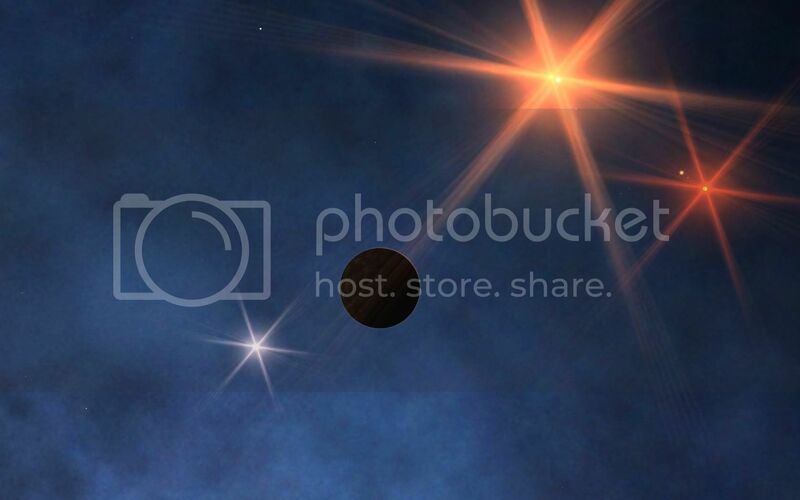 I also find habitable worlds orbiting blue stars fascinating. Both are quite uncommon. However; IC 1011 has the exotic - a blue-star system with a Terra planet, that is only 13,600 AU (0.066 pc OR 0.21 ly) away from the core. Give us a run down, Zen. INFORMATION: RSC-10376-1551-0-0-3539 is a binary system, with one B9-V and one F4-V star, both orbiting around a common gravitation reference. 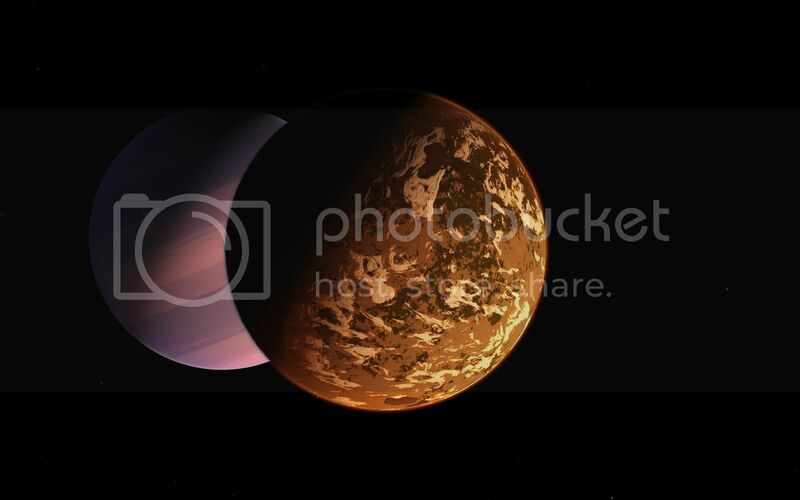 Two ultra cold gas giant systems orbit the reference at 310AU and 550AU, respectively. Alpha star, rated B9-V, has a four planet system; three warm inner gas giants, and one temperate outer Terra world. Beta star, rated F4-V, has six planets; two gas giants and four solid worlds. All Beta-star worlds have surface temperatures that exceed human tolerances. The single Terra-class world in the system is 11.6 AU from Alpha star, in the furthest orbital position. It has no notable natural satellites, and no ring system. Beta star does provide secondary illumination, at apparent magnitude -20.36. Gravity is 59.07% above Earth norms, although it is well within tolerable ranges for Terran humanoids. It's diameter is 25% greater than Earth's, and masses 2.5 times Earth, indicating an abundant heavy material composition. Temperature averages 61.03*F, which is similar to Earth. Atmospheric content is oxygen and nitrogen. Atmospheric pressure is 21.87% of Earth's - partial, non-positive-pressure life support is required for extended surface excursions. Unprotected exploration is possible, however death due to oxygen starvation will likely occur in under 48 hours. The thin atmosphere allows for minimally obstructed viewing of the local interstellar group, even during daylight hours; the nearby galactic black hole event horizon can be easily observed with a professional telescope installation on the planet's surface. Water covers over 75% of the world's surface; advanced water erosion and flow patterns exist, with larger land masses supporting significant river systems. Most land masses consist of bare rock with some clay-like terrain. Despite lack of life-bearing designation, green-colored terrain patches indicate some simple biological or chemical surface activity, to be investigated later. There are tall, snow peaked, mountainous regions in some regions, indicating ongoing or recently ceased vulcanism. The planet has an orbital period of 23.219 Earth years. A local day is 12 hours, 46 minutes, and 36.83 seconds long. A nice quite place were I can take good long holiday. My favorite place has got to be the Milky Way's central core black hole.. I decided to take a peek inside and it ended up crashing my game instantly. SpaceEngineer you clever dog you.